Extensively illustrated from basic principles to system design, the fundamental concepts of RF, microwave, millimeter wave, and terahertz detection systems and techniques to find concealed targets are explained in this publication. These concealed targets may be explosive devices or weapons, which can be buried in the ground, concealed in building structures, hidden under clothing, or inside luggage. Concealed targets may also be people who are stowaways or victims of an avalanche or earthquake. Although much information is available in conference proceedings and professional society publications, this book brings all the relevant information in a single, expertly written and organized volume. 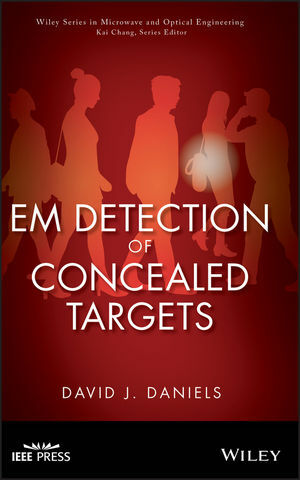 Author David Daniels has many years of experience designing and deploying EM systems to detect concealed targets. As a result, this publication is essential for scientists and engineers who are developing or using EM equipment and techniques for a diverse range of purposes, including homeland security, crime prevention, or the detection of persons. David J. Daniels, BSc, MSc, CEng, FIET, SMIEE, is the Chief Consultant for Sensors at Cobham Technical Services (formerly known as ERA Technology). David has more than thirty years of experience in the development of radar, acoustic, and electromagnetic systems as well as products for security, sensing, and test applications for the military and commercial enterprises. He has brought such products to market as acoustic detection systems, fiber optic cryogenic liquid leak sensors, marine radar rescue transponders, ultra-wideband microwave amplifiers, ground-penetrating radar, land-mine detectors, and RF and microwave security systems. His current interests center on sensor systems for land-mine detection, homeland security, and military counterterrorist activities. List of Frequently used Acronyms. 1.3 Market Needs for Security. 1.6 Forensic Detection of Buried Bodies. 1.7 Avalanche and Earthquake Victims. 1.9 Concealed Targets on Humans. 1.12 Statistics of the Detection Performance of a Sensor. 2.2 Propagation of Electromagnetic Fields in Free Space. 2.3 Propagation of Energy in a Dielectric. 2.3.2 Velocity in a Dielectric. 2.3.3 Impedance of a Dielectric. 2.3.4 Propagation Loss in a Dielectric. 2.3.5 Coupling Losses into Materials. 2.4 Dielectric Properties of Soils and Rocks. 2.6 Atmospheric Absorption of Electromagnetic Waves. 2.6.2 Dust, Smoke, and Sand Storms. 2.7 Attenuation of Electromagnetic Fields by Materials. 3.2.4 Side Lobes and Back Lobes. 3.2.6 Polarization—Linear, Elliptical, and Circular. 3.2.9 Time Side Lobes and Ring-down. 3.4 Antennas for Proximal Operation. 3.4.2 Coupling Energy into the Ground or a Dielectric. 4.3.3 Receiver and Coil Considerations. 5.3.3 Stepped Frequency Radar Systems. 7.3 Earthquake and Avalanche Radar Systems. 7.5 Through-Wall Radar (TWR) for Surveillance. 7.7 Land-Mine Detection Radar Systems. 7.7.1 Handheld Land-Mine Detection Radar Systems. 7.7.2 Vehicle-Mounted Land-Mine Detection Radar Systems. 7.8 Radar for General Search Operations. Brings together in one volume the core information on a variety of electromagnetic techniques.